In the next few weeks I plan to publish three book reviews here at the site. Each review will come out in multiple instalments (two or three most likely), and each review (but not each part!) should include a short video in addition to text. This has been in the hopper for far too long now, but alas the time is fulfilled. Expect more reviews in coming months, too. So what are the first three books? 1. 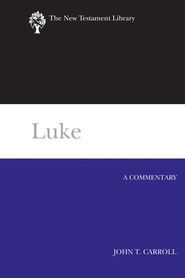 John T. Carroll, Luke: A Commentary (NTL; Louisville: WJK, 2012). 2. 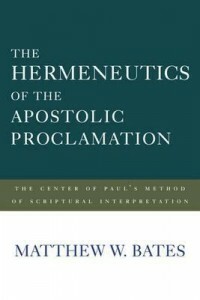 Matthew W. Bates, The Hermeneutics of the Apostolic Proclamation: The Center of Paul’s Method of Scriptural Interpretation (Waco: Baylor University Press, 2012). 3. 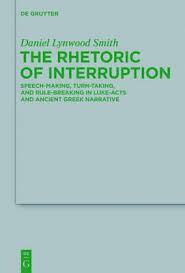 Daniel Lynwood Smith, The Rhetoric of Interruption: Speech-making, Turn-taking, and Rule-breaking in Luke-Acts and Ancient Greek Narrative (BZNW 193; Berlin: De Gruyter, 2012). I intend to write a thesis at Master’s level with the title “Paul’s Perspective on Church Unity based on 1 Corinthians 1-4” and I need help. Warm regards. Paul Cheng. Paul, thanks for stopping by. These three books (above) probably won’t help much :). I assume you have a supervisor of some kind who oversees your thesis, so I would first recommend you look to him or her for specific guidance. As I. Howard Marshall once told me, always listen to your supervisor. I have a few quick thoughts about your thesis based on the title: (1) Be sure and justify why you’re confining your study to just the first four chapters of 1 Corinthians. Why not look, e.g., at 1 Cor 12–14, the whole of the letter, or include other Pauline texts on the subject? (2) Carefully define “church unity”. Will you look at Paul’s dealings with Jew-Gentile relations (not as prominent in 1 Cor 1-4 as, say, Romans)? (3) Take into account the problems in the Corinthian church (or more broadly, the situational character of the letter). It seems to me that the disunity of the church there has something to do with social divisions unique to that church (i.e., teachers/leaders one associates with, esp. as it relates to the perception of their wisdom). The presence of these divisions seems to be felt in the church’s corporate worship, too (1 Cor 12-14). Of course, there are a lot of other issues going on. The point is, these must be factored in. In short, I don’t think studying 1 Cor 1–4 will yield “Paul’s perspective on church unity.” It will only give you part of Paul’s broader perspective on the issue. I would suggest that you include more texts. Perhaps limiting your study to the letter of 1 Corinthians (so as not to bite off too much) or, if you’re inclined to a view that 1 Corinthians is a composition of multiple letters (I’m personally not convinced by this view), then confine your study to some such partition (of course, this, too, must be defended). Skimmed # 2 a few times before deciding I just didn’t have time to read it (yet). Looking forward to the review! Let me know what you think if/when you read it!